Standing on a dingy side street, a stylised sign of an oversized scythe cutting through an ankle spurting a ridiculous amount of blood marks this semi-reputable establishment. Run by its one-legged owner Arvo Outila (N old male human expert 2) this inn has operated under its current name since he purchased it 15 years ago after a horrendous accident on his farm. It doesn’t offer food or accommodation. This is a place to drink (often heavily) and listen to music. The tavern has a narrow frontage, but extends back a surprisingly long way. Steps lead down from the street into the main common room, which is dingy and often smoke-filled. A bar runs down one side of the room and steps downward lead to another large drinking room. 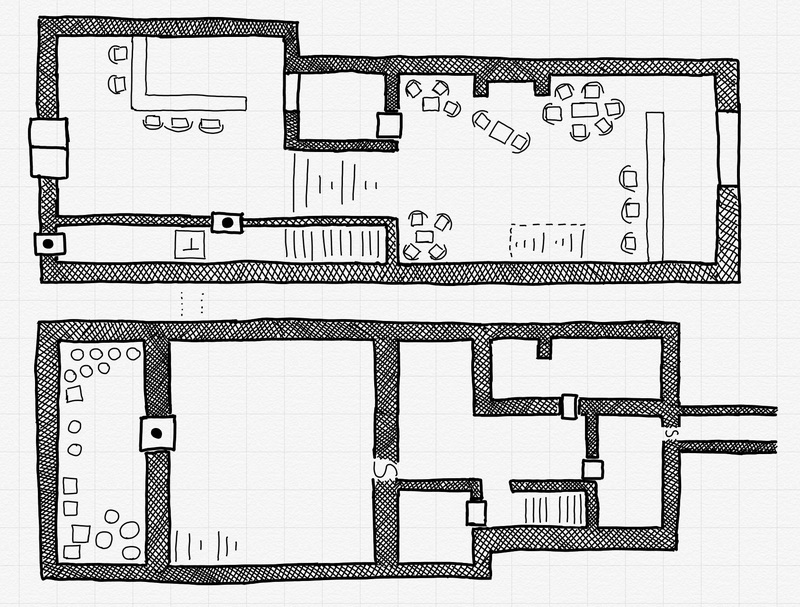 The lower common room is popular with those who wish to escape notice—illicit lovers prefer this more private room as do those who do not wish to be overheard—perhaps adventurers plotting their next quest. The Scythe is renown for its live performances. The upper common room has a small stage which hosts performances—some of dubious quality—most evenings. Mid-week sees the “famed” halfling bard Dricolen Nimblefinger (N male middle-aged halfling bard 2) take to the stage. Bafflingly, Dricolen has a devoted following amongst the locals and when he performs, the Scythe is packed. Arva Outila (N old male human expert 2) The one-legged, long-haired owner works behind the bar most nights, hopping dextrously about. He is friendly, but a little morose and when deep in his cuts bemoans the accident that cost him his leg. Anafa Goodwater (NG female halfling rogue 2) Yet young, Anafa has already retired from adventuring. The only survivor of a disastrous expedition to Gloamhold, she blames herself for her companions’ deaths. She is cheerful and light-fingered, but only pilfers a few coins from those too drunk to notice. Delthur Elduum (N male dwarf fighter 3) This immensely fat dwarf serves as the tavern’s only occasionally needed bouncer. Normally, he is to be found at the bar nursing a cup of spiced wine. He is surprisingly perceptive and intelligent for a dwarf and see all that goes on. 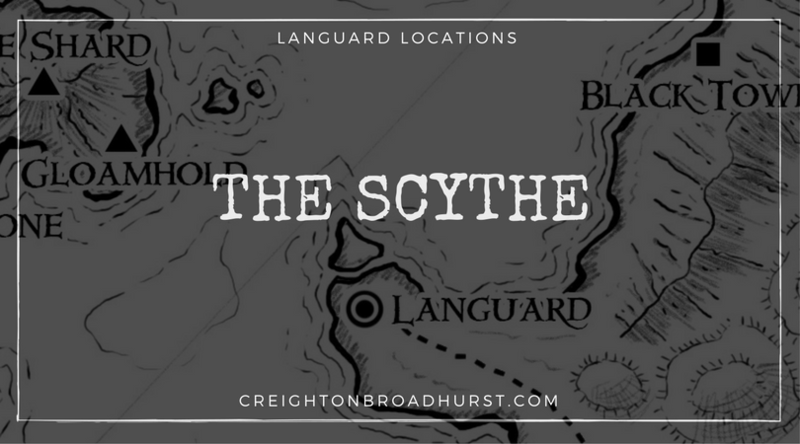 Several regulars drink at the Scythe. They include: Berig Many-Belly (male dwarf), Calum (male human), Danil Farwander (female halfling), Elarik Swiftwind (male elf), Hard Armbreaker (male half-orc), Garrow (male human), Parg (young female half-orc) and Skaar (male half-orc). Thanks for the kind words Philipp. You are the second person to bring up VT and/or online access to Raging Swan Press’s stuff. I guess I’ll have to drag myself out of the dark ages at some point and look into it! Thanks for the nudge! This is great, thanks for taking the time to post this. It has cool flavor with various performing areas and three levels, I like the tavern keeper but wouldn’t a bar run by a one-legged wonder just have one level? Or just a couple steps at most? The risk of a fall and subsequent serious injury seems high. Just sayin’. It could also be the one armed tavern keeper, with his long faded gold tresses and the like who gets morose missing his other arm. Could he be haunted by his other hand? A crawling claw? Wearing a ring of telepathy or empathy of some-such torments poor Arva’s dreams. What if Arv stole another mans wife? The man returns (from years at sea or from slavery down south or a prison galley for the scarlet brotherhood) and found his wife gone and married to Arva. He took Arva’s left arm (and wedding band) to viciously return the favor. Gives Arva a reason to be morose when in his cups.